I'm not sure why but there are a lot of readers who are interested in what I do each day. I'm ordinary. Usually I'm here at home doing ordinary things. When I'm writing, which I am at the moment, there's not a lot to report in my normal daily activities - I make three meals, clean up and write most of the day. But yesterday I took time away from the computer and spent most of the day working in my home, and relaxing. Up at 3.30am, I dressed, cleaned my teeth, checked emails, made tea and crumpets and packed my trusty little trolly in the boot of the car. When I left home at 5.00am to go to the local market, the sun was just peeking through. I was after some fish for our terracotta pond which sits on the front verandah. Tricia bought me a beautiful iris last time she was here, it's been flowering its little head off and while it sits in water to grow, the water provides a breeding ground for mosquitoes. We used to have some native rainbow fish in the pond but when I moved it last week, I realised they'd disappeared. 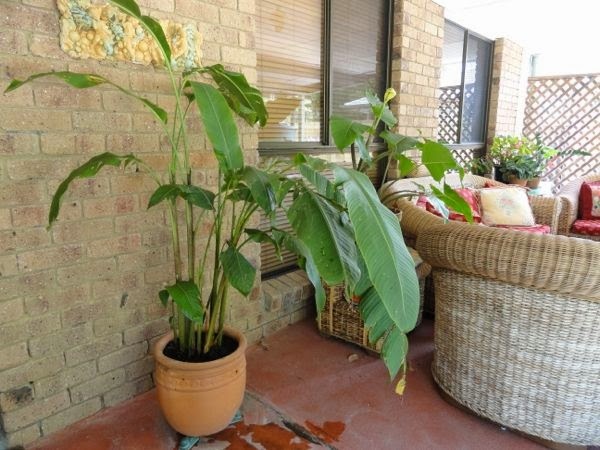 Also on my list, a tall tropical plant for the area near the front door and some avocados. Hanno needed line for his whipper snipper. The market was packed when I arrived at 5.20. Some were sipping coffee, others walking around eating toasted sandwiches or fruit. It didn't take me long to find what I needed and I was in and out very smartly. I was home again at 6.45. Hanno was sitting at the kitchen table eating his breakfast - rolled oats with blueberries and walnuts. I had five little guppies in a plastic bag so I had to work fast to get them into their new home. 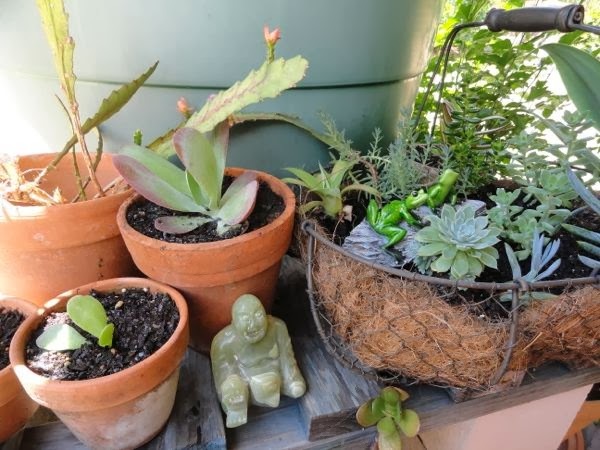 I emptied the water out of the pond with a bucket onto the hanging baskets and pot plants, moved the pond back into the shade of the verandah, then filled it again with rainwater from the tank. I cleaned up the iris, clipped off the dead flower heads and placed the plant in the water. When I opened up that plastic bag the fish swam out into their new home. 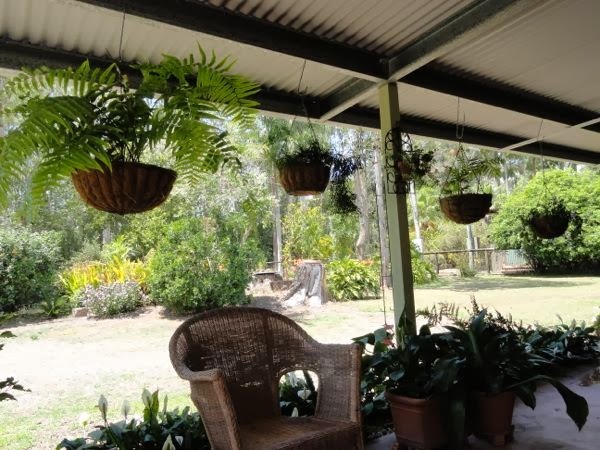 The verandah feels cool and restful with the water and plants. It's reminds me how easy it is to create a relaxing space when you have shade, somewhere to sit and a few plants. When everything was set, I swept the verandah then went inside to make some cool drinks for us. By this stage Hanno was watering plants in the front garden. Usually we don't have to water our outdoor plants but we're in the middle of a drought. We both rested with some early morning tea - apple and cinnamon pikelets and lemon cordial made with sparkling mineral water and ice. I made the bed, finished off another two napkins (more on that tomorrow), washed up and prepared lunch. Crumbed chicken breast with the last of the potato salad, lettuce, avocado, tomato and cucumber. After lunch I repotted the large heliconia I bought. It's sitting right near the front door now. It's still a bit untidy but as new leaves grow, it should look really splendid. I gave it a rich potting soil containing worm castings and cow manure so it shouldn't be too long before it takes off. Late in the afternoon we adopted a baby magpie that's been hanging around without its mother for a few days. 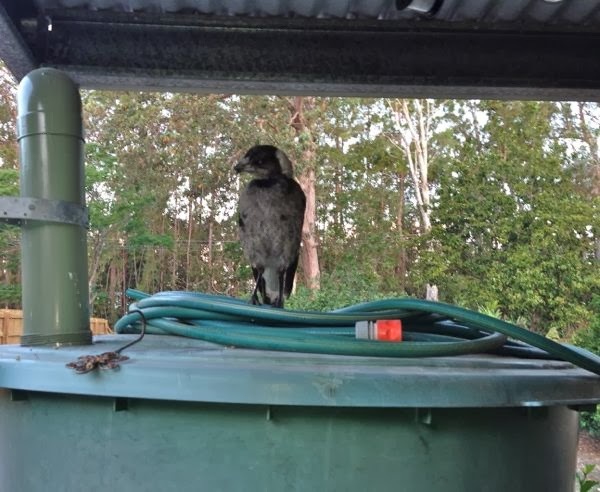 It flew into the verandah and sat on the back of the lounge where I was sitting, so Hanno got some tiny pieces of pork sausage to feed to it. It must have been very hungry because everything Hanno gave it was eaten. It looks like it has a damaged beak. I have a feeling the mother is dead because this baby it too young to be alone. We'll look out for it over the next few days and continue feeding it if it turns up without mum again. 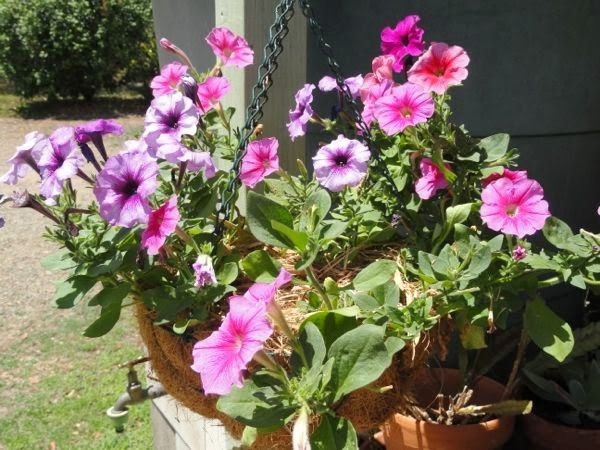 And for the rest of the afternoon, dear friends, I put my money where my mouth is and I relaxed on the front verandah. I read and knitted Jono's cardigan. It was everyone for themselves at tea time. Hanno made himself sandwiches and I had some watermelon. It was a beautiful mix of productive energy, fixing this and that, and shoes off, feet-up relaxing. I hope you did some of that as well. It's back to work again today but I'll be out on that verandah again to break the work day up. I work better when I look after myself. I think we all do. Hi Tammy, good to see you again. I suspect the birds took the old fish, but I can't be certain. Like your place, there certainly are a lot of birds here. You had a great day! Sometimes it's hard to identify why the day went so well but you nailed it, recharging the batteries,dabbling with living things, the joy of things to come, daily creativity and good nutrtion. 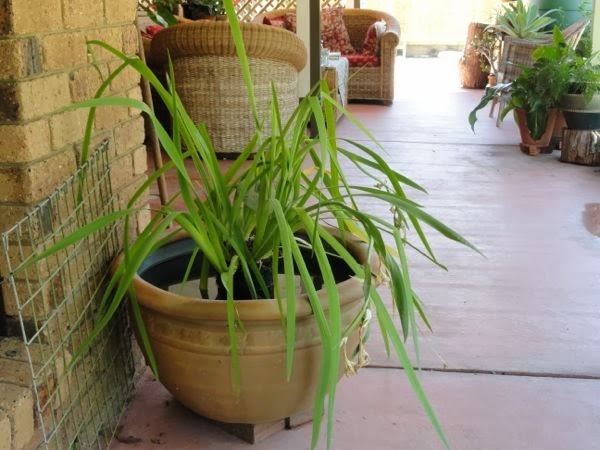 I was just wondering about your cane lounge and whether it will get mouldy living on the verandah. I've been tempted to put soft furnishings etc outside ,we live on the south coast of NSW-very humid in summer. Is there any treatment the natural fibres need to survive the moisture? Thanks for sharing your day, it's inspiring and restful. Jennifer, this lounge replaced an antique cane lounge we had out there for the past five years. It never had any mould on it or the cushions, although it is very humid here from November through to the end of February. I think the key is the breeze. Mould needs still, warm and darkish conditions. If you can place your soft furnishing in an area where there is good air circulation, you probably won't have any problems. I hope you have a lovely day. thanks rhonda for your reply. do love cane lounges. yep. that's something I have to keep reminding myself when busy - to eat! It's so easy to get caught up in the busyness of business. Ah, my fave kind of day. A bit of constructive "this and that" followed by guilt-free relaxation. I love the matter of fact way you say "get up at 3.30am". In the summer, I can leap out of bed at the crack of dawn but now, in Scotland in October, I am dragging myself out of bed in the morning. It is still pitch black at 8am and my body is just saying "No, go back to bed, what are you doing!!" Even the chickens are somewhat startled when I open their door. "Cluck! Is it dawn? We don't THINK so. Cluck?" I'm thinking of buying one of those gentle-wake-up-light-getting-brighter-soon-time-to-get-up lights so that I don't feel so shocked when the alarm goes off. Your new outdoor lounge area looks so nice and inviting, what a lovely way to spend some spare time. I have a fish "pond" very similar and I put a small fountain pond pump in and the tinkle of the water dropping into the pond is just delightful, just turn it on when you are sitting there or want to hear the sound in the house.....sooooo relaxing........no plumbing needed, just a power point ! Rhonda, I am always amazed when you say you get up so early. I don't go to bed till after 11pm so am not fond of getting up early. I guess you go to bed early though. It is incredible to think that you are in drought in Landsborough as everything always looks so lush there when we drive through on our way to Caloundra each year. We had an inch of rain last week but everything has dried out again. We aren't allowed to use town water on the garden today so it is a day for using tank water and a watering can. Obviously our council isn't taking any chances of our city nearly running out of water again. I hope you get some rain soon up there. How lovely to be sitting out on that veranda in the heat of summer! Very inviting. Your veandah is so lovley Rhonda, colourful, and inviting - I would have a hard time not settling in there all day with my feet up. I am glad you had some relaxing times this weekend. I must admit I like reading about everyone's normal days, mainly because they are different than mine. 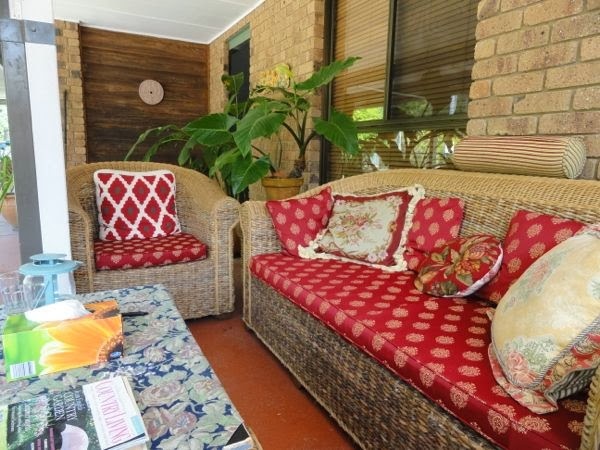 I do love your verandah area though, and am inspired to look at sprucing up my downstairs patio which is really just a slab of concrete where everyone leaves their stuff. Another project to add to the list :) Thanks so much for providing a link to my blog last week. I had many new visitors...which are more than welcome to stay. I tend to struggle with getting enough rest and letting myself relax, but I'm always better for it when I do! Your veranda looks like such a comfortable and happy place - It reminds me of my Aunt's old cozy deck where family would gather to eat and chat well into the night. Although it can look not very nice, wide mesh can be fixed over both small and large ponds to stop fish being taken. My neighbour lost all his fish to heron's. Also, some slow growing oxygenating weed and small fish can be put into water butts providing the tops are off. 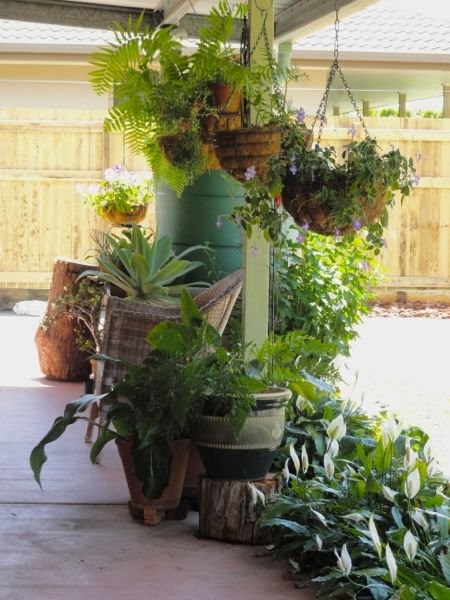 Your verandah looks so great with all the plants. Very cozy. In love the little magpie. I hope it will return and can grow up to a wonderful grown up magpie !! We're now in late autumn in the U.S. so the sun doesn't come up until after 8:00. My body clock is already in winter mode. What a lovely post and pictures. I can see myself coming for a visit and enjoying some coffee (can you tell where I'm from ;-) ) with you on your verandah. I have a small uncovered porch front porch and some day, I would hope to have a home that has a nice covered porch and a lovely sitting area such as yours.